Karnataka MBBS Admission 2019 – The Karnataka Examinations Authority (KEA) will be starting the Karnataka MBBS 2019 admission process most likely in the second week of June 2019. The admission to Karnataka MBBS BDS 2019 will start with the invitation to fill the application form. It is mandatory to fill the application form for Karnataka MBBS admission 2019 to be considered eligible for the process. These candidates will be included in the provisional merit list of Karnataka MBBS 2019 admission. Predict chances in 3000+ colleges, Know All India Counselling & Admission process etc. Applicants could be Indian Nationals/Non-Residents of India/Overseas Citizens of India/Persons of Indian Origin. However, only Indian citizens will be eligible for all the type of seats except for NRI quota seats. Only those candidates who will qualify NEET 2019 will be considered eligible for Karnataka MBBS 2019 admission process. Candidates must fulfil the domicile criteria or other regulations depending on the type of seats that they are applying for. In terms of age and academic eligibility, the criteria will be the same as laid down by the National Testing Agency (NTA). i) General Merit – Private seats (GMP): 50% of the above 42% seats. i) 66% seats are reserved for the respective religious and linguistic minority. The application form for Karnataka MBBS admission will be released most likely in the second week of June 2019. The application form will be released in online mode only. 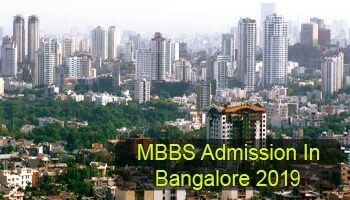 Karnataka MBBS application procedure will include submission of personal, academic, contact, and reservation details. The application fees for Karnataka MBBS BDS admission must be paid via Bank challan while the amount that needs to be paid will be revealed with the starting of the registration process. Candidates filling the form will be included in the provisional merit list for Karnataka MBBS 2019 admission. The facility of filling Karnataka MBBS application form will be available before the starting of second and the mop-up round of counselling. 7.Study certificate attested by Block Education Officer or Deputy Director of Public Instruction (DDPI). There will be two Karnataka MBBS 2019 merit lists released by KEA – provisional and final merit list. The provisional merit list for Karnataka MBBS BDS admission 2019 will include the name of candidates who have successfully completed the registration process. While the final merit list will include the candidates whose documents are verified and are given the security key. Karnataka MBBS merit list will be prepared on the basis of NEET 2019 score only. The merit list for Karnataka MBBS BDS 2019 admission will include candidates’ NEET Roll No., CET No., gender, category, domicile status, nationality, All India Rank, and NEET score. Both the merit lists will be only released in online mode and candidates will not be informed individually about the release of Karnataka MBBS BDS merit list. The round one of Karnataka MBBS counselling is expected to start in the second week of July. The counselling for Karnataka MBBS admission will be conducted in online mode only. There will be three rounds of Karnataka MBBS counselling – first, second and mop-up. An additional round of Karnataka MBBS 2019 counselling will be conducted if the seats remain vacant. Candidates will be given a security key after the verification of documents. With the security key, login to the applicant portal will be required to participate in the Karnataka MBBS 2019 counselling process. Candidates are suggested to prioritize their choices as per their rank and category for Karnataka MBBS admission 2019. Choice 1 – Candidates who will accept the allotted seats by reporting to the colleges will fall under this category. Such candidates can download the admission order and pay the admission fee. These candidates cannot participate in the next round of counselling. If in case, a candidate opts for Choice 1 and does not report to the allotted college then his/her fee will be forfeited and the candidature will be cancelled. Choice 2 – Candidates who are satisfied with the allotted seat but also wish to participate in the next Karnataka MBBS counselling round. Such candidates can pay the prescribed fees. If a higher option is allotted in the next round then the earlier allotted seat will be cancelled automatically. If a higher option is not allotted then the earlier allotted seat remain with the candidate. Choice 3 – Candidates who do not accept the allotted seat. However, they wish to participate in the next round of Karnataka MBBS BDS counselling. These candidates will be required to cancel the allotted seat and re-order the already entered options. Choice 4 – Candidates who are not satisfied and are not willing to continue with the counselling process. These candidates will not be considered for the next round of counselling for Karnataka MBBS BDS admission 2019. NEET 2019 cutoff Karnataka will be revealed after the conclusion of the counselling processes. The cutoff for All India Quota and State Quota seats of previous years will be provided for the ease of candidates. NEET cutoff for Karnataka MBBS admission will help in understanding the target score and rank for each category of the seat in government and private medical and dental colleges. The cutoff will be stipulated on the basis of previous year counselling result, therefore, a particular score or rank does not confirm a seat. However, it gives an estimation of the chances of admission on a NEET score or rank.